On New Year's day, (Now-Ruz) everyone should wear new clothes, and have had made ready the "Ha'ft Seen" that is a table containing seven grains representing seven "Reason of Good Deeds". Decorated table should have seven traditional items the names of which in Iranian language (Parsi) begin with "Seen" or the letter "S". This item should be safe good to eat, the names are pure Parsi and are herbaceous. Aslso are not combination word, it means are one word name. Among the most popular are: 1-Seeb (Aple), 2-Seer (garlic), 3-Sumagh (Sumak), 4-Serkeh (Vinegar), 5-Samanoo (sweetmeat rough made of weath), 6-Sabzi (Green vegtables), 7-Senjed (Kind of Mountain-Ash fruit). If one searches in the Iranian Dictionary there is no eighth item that carries all condistions. 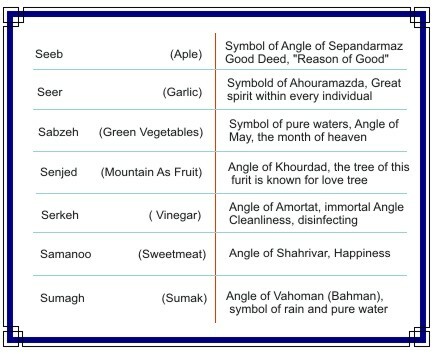 in tradition table people addes, Sonbol (Hyacinth), which is symbolf of Nature fragrance ang green house, Sekkeh (Coin) that is symbold of wealth, and some other items, as these items are not eatable, they are not herbaceous, nor they are pure Persian names. As sekkeh and Sonbol are Arabic names. Historically there was no reference to the book, any book, after Islam invaded Iran, people to keep the tradition going added Koran and used some Arabic words praying. Nowadays that this is not an issue, people like using "Book of Kings = Shahnameh" (Epic of Iran's history) or Hafiz poems. Here under you will see a traditional 7 Sin table. In addition, there should be a dish of greens, which usually consist of freshly sprouted wheat or lentils, grown in a dish or tray, symbol of rejuvenation of life. In addition to these traditional items, the table may also be decorated with candles, milk, cheese, eggs colored and painted, cakes and sweetmeats and goldfish in a bowl. The goldfish is believed to be a sign of unexpected favors that will be received. The period of Now-Rooz festivities extends for two weeks, and its end is marked by the celebration of the thirteenth day (Si'zdah). This is a public holiday, and on that day families traditionally take their samovars and rugs out into the country side and enjoy a picnic. 1- سيب. 2- سير 3- سماغ (سماق تازی است) 4-سرکه 5-سمنو 6- سبزی يا سبزه های رشد کرده از هفت دانه گوناگون 7- سنجد میبينيم که همه دارای همان پنج ويژگی هستند و نام هشتمی هم در ميان خوراکی های ايرانی نيست. چون ويژگی در اين بود يک يک واژه باشند بنابراين واژه های ترکيبی مثل سيب زمينی، سبزی پولو پذيرفته نمی باشد. گرچه مردم اصرار دارند گل سنبل در خوان نورزی باشد، ولی سنبل يک واژه تازی است و خوراکی هم نيست. سکه و سماور هم به ترتيب واژه های تازی و روسی هستند و هيچکدام خوراکی و آن ويژگی های لازم را ندارند. سير نماد اهورا مزدا، نماد آن خرد انسانی است که در هر فردی وجود دارد، سبزه نماد فرشته ارديبشت، آبهای پاک و تراوت زمين است، سيب نماد فرشته سپندازمز، زن، باروری و پرستاری و شادابی است، سنجد نماد عشق، مهر و فرشته خورداد و دلبستگی است، سرکه نماد امرتات (امرداد) به چم بی مرگی و جاودانگی است، سمنو فرشته بهمن و نماد باران و طراوت و شادابی است. We would like to thank all those who granted us to use their library, their input, contribution. Also we would like to thank those who allowed us to link this site to various other sites in the world wide web. We would also like to take this opportunity to thank those who helped us with their Proof reading and Professional help.